March 2018. Mitochondria are intricate membrane organelles found in virtually all eukaryotic cells, where they serve a number of essential physiological functions. Their central role is to provide energy to the cell in the form of ATP by oxidative phosphorylation. The mitochondrial respiratory chain consists of four complexes (I–IV), which transfer electrons from NADH and succinate to molecular oxygen. A part of the energy gained in electron transfer is used to pump protons across the inner mitochondrial membrane. The resulting proton gradient is utilized by the mitochondrial ATP synthase to generate ATP. Three of the electron-transfer complexes form supercomplexes, which are thought to be instrumental in channeling electrons from the substrate to the acceptor. 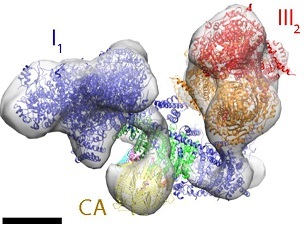 Scientists at the Max Planck Institute of Biophysics in Frankfurt am Main used electron cryo-tomography and subtomogram averaging to investigate the in situ structure and organization of complex I and the respiratory chain supercomplexes of mammals, yeasts and plants. They discovered that the mutual arrangement of the two largest components—complex I and complex III2—is essentially the same in all supercomplexes. Tomographic volumes containing complex I were averaged at ∼4 nm resolution. Principal component analysis indicated that ∼60% of complex I formed a supercomplex with dimeric complex III, while ∼40% were not associated with other respiratory chain complexes. In addition to the mutual arrangement of complex I and III2, up to two copies of monomeric complex IV were associated with the complex I1III2 assembly in bovine heart and the yeast Yarrowia lipolytica, but their positions varied. No complex IV was detected in the respiratory supercomplex of asparagus. Instead, an ∼4.5 nm globular protein density was observed on the matrix side of the complex I membrane arm, which the scientists assigned to γ-carbonic anhydrase.